The Bailey’s cream pots literally take minutes to prepare. Just be careful to whip your cream lightly, as the alcohol in the Bailey’s will slightly thicken it anyway. While the shortbread will keep well in an airtight container for up to one week and is just the thing with a cup of morning coffee. Whip the cream in a bowl until soft peaks have formed. Place the Bailey’s Irish cream in a bowl with the espresso, mascarpone cheese and icing sugar. Beat until well combined and then fold in the cream. Divide among 4 x 200 ml/7 fl oz ramekins or cups and chill for at least 2 hours or overnight is fine. To make the shortbread biscuits, preheat the oven to 180C/350F/Gas 4. Sift the flour and salt into a bowl and set aside. Cream the butter and sugar in a separate bowl until pale and fluffy. Slowly beat in the egg and then work in the sifted flour until you have achieved a fairly soft dough. Knead the dough lightly on a lightly floured work surface and roll out to a 5 mm/1/4 in thickness. Using a heart-shaped cutter, stamp out biscuits and then arrange on non-stick baking sheets. Bake for 8-10 minutes until cooked through and lightly golden. Leave to cool for 5 minutes, then transfer to a wire rack and leave to cool completely. 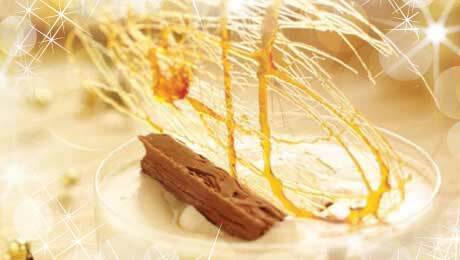 To serve, arrange the Bailey’s cream pots on serving plates and decorate with chocolate curls and spun sugar. Add the shortbread biscuits and dust lightly with the icing sugar and cocoa powder. Made them last year for Christmas and they were absolutely beautiful. The family loved them and have made them during the year for special occasions. So simple to make.